When Deb and I started praying about joining the SOWER ministry, one of our unresolved concerns was that we would be leaving in Colorado some very deep-rooted, long-standing friendships. “How would we do being separated from these friends?,” we wondered. A parallel concern was how we would do in a mobile ministry where the group of people with whom we would serve continues to change each month. Hmmmmm… We are both fairly social, “people-people” and friendships are important to us. In fact, we are dependent on them. Darting around the country certainly appealed to us as adventure-seekers, but the lifestyle left a “friendship hole” in our personal community. For we are called to encourage one another and to build one another up..., to share joys and to bear one another’s burdens, right? Community is a requirement! ​Brothers and Sisters in Christ are called to community. From the beginning God has made it important for man to be part of a biblical community. Both horizontally and vertically. Horizontally, we are the most comfortable with our lifetime friends, obviously. These are friends with whom we can share our deepest thoughts and life experiences. These people are like warm blankets that envelope our soul. Our lifetime friends are back in Colorado. We miss them often. What we did not fully realize is the role SOWER friends would play in filling the “friendship hole” in our personal community. All of the SOWERs we have met have been genuine, enthusiastic, sociable, and like-minded. We are all Christians, we are all servants, we are all [mostly] retired, we are all RV’ers, and we are all together for three or more weeks with the exact same agenda, so there is a lot of common ground. When you are with such a group for so much of the time, it only takes a couple of days for jocularity to set in. “How many SOWERs does it take to screw in a light bulb…?”, you may ask. And the answer is not "one!" And then there are the project hosts and staff (in the ministries where we serve) that we have gotten to know so well -- there is some amazing Kingdom work being accomplished by some amazing Kingdom servants, for sure! It is not unusual to stay in touch long past the last time we were face-to-face. Beyond the monthly project, the extended family of SOWERs is connected electronically, all across the country. SOWERs have a dynamic eMail prayer chain; we pray for fellow SOWERs whether we have met them [yet], or not. On each assignment, in the first week we learn about each other, hear testimonies, learn quirks and personalities. The second week we begin to feel comfortable and start to ask deeper questions and share a little more; we even begin to tease each other. We learn of life stories, past ministries, amazing gifts and talents, and how the local ministry has been blessed. The third week cements our relationships and builds hope that, post-project, our paths will cross again. For a fast-paced three weeks, we have worked, prayed, camped, played, laughed, and shared meals together. In this time, we have gleaned from each other and grown personally; we have new exposure to His Kingdom and are better prepared for meeting future friends. And then we move on. The friends we have met through the SOWER ministry are wonderful new friends, but they are friends for a season and for a reason. We believe that He has given us season friends to help us to reconcile our concern about leaving lifetime friends in Colorado. And He has given us season friends to further convict our hearts about His mighty outreach across this country. He is doing it by giving us more and more friends than we have ever before had! Not only the SOWERs that we are meeting but also the friendships we are making with the wonderful camp staffs at all of the places where we have been graciously allowed to share our gifts and talents. As Deb and I continue our travels in this favored ministry, we realize that the God who blessed us with the opportunity to join SOWERs has also provided us many seasonal friends to help fill the “friendship hole” in our personal community. But He has also given to us an opportunity to first-hand witness how expansive and dynamic His reach truly is. Our lifetime friends may be in Colorado, but our Friends (with a capital “F”) are now EVERYwhere. They are not just at bible study in Colorado, or at the office, or “down the street.” We are developing a God-given network of friends that literally spans the entire country. Being a RV’er is not just about freedom, travel, and independent living -- it is about being part of a sizable, yet often overlooked community. When you talk to someone in the society of RV'ers you know from the get-go that you have at least a few things in common: you are likely [soon] retired, you enjoy meeting new people, and you share at least three hobbies (dogs, adventure, and wanderlust). One less obvious common denominator is that you are also a tinkerer (things do tend to need readjusted from-time-to-time when you move your home at 62mph down a busy, bouncing highway day-after-day!). Rallies are a great way to experience this community! 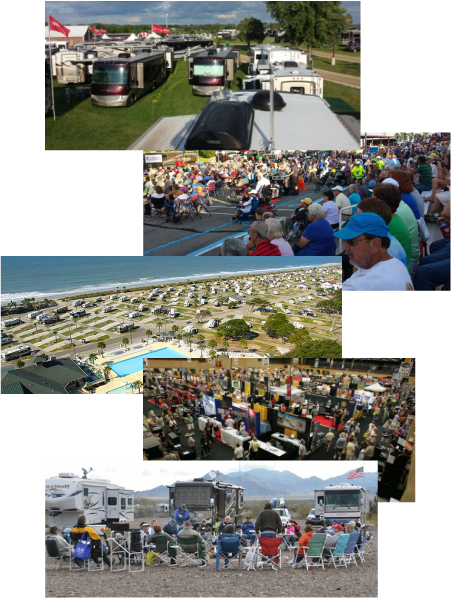 Wherever two or more are gathered, full-timers or not, an RV rally breaks out! Hyperbole aside, the RV community is largely social -- the group is gregarious, charitable, and impromptu. We have seen happy hour get-togethers, game nights, and potlucks materialize from nothing more than a group of RVs that happen to have parked themselves in the same general area. When RV'ers assemble more formally and for a common theme, it is called a Rally. It could be a rally for Freightliner owners, solar modifications, craft shows, NASCAR, ham radio, folk music, Jeeping, geocaching, an expedition to Mexico or Alaska, photography or ministry (the list is endless, actually). I have no way to know for sure, but my guess is that there is no time in America when there is not an RV rally going on somewhere, of some kind, of some fun theme. Check out the YouTube below for a rally that was themed, "Out of This World!" (SEE KEN AND DEB AT 46 SECONDS!). In addition to experiencing a greater sense of community, full-time RV’ers tend to live less stressful lives than their retired, non-RV’er colleagues. After all, they have minimal possessions to maintain, no yardwork to burden them, they have virtually complete control over when and where to travel, and when they want to travel, there is no concern about prepping or packing because everything they have is usually right with them. Most will travel the entire United States and never need a suitcase. ​It is not unusual to find a warm group of "RV strangers" coming together around a roaring and talkative campfire to chat and share stories of everything from scenic parks to bad roads. The most impressive virtue, however, is the RVer's willing, cheerful helpfulness. No matter what kind of challenge travels in your motorhome brings, there will always be a fellow-RVer willing to help out! Most RV'ers will tell you that since they started their RV'ing adventure they have developed a significantly expanded social network. We know that we have.